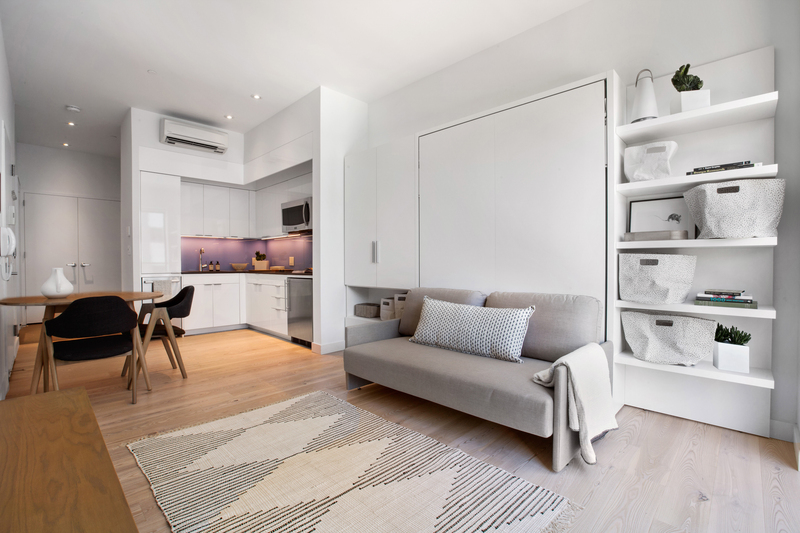 An image of a micro-unit at Carmel Place. Photo courtesy of Ollie. KIPS BAY — There’s been a rise in real estate companies focused on millennials and the reality that New York City’s rental landscape means roommates are a necessity. But they're also trying to add value to the equation by making other aspects of the moving experience more affordable and manageable. That often means trying to cushion the landing for renters by helping them with everything from decorating and cleaning to filling their social calendar. Room Ring recently partnered with 20 other hip startups to give users discounts on everything from meal planning (Blue Apron, UberEats, Drizly) to fixing up your new home (Paintzen, Cleanify) and decorating it (Casper, Aptdeco, Laurel & Wolf). Having a furnished apartment was a big draw for Jason Kim, a 35-year-old finance worker, who wanted to move somewhere quieter than his Hell’s Kitchen neighborhood. A micro-unit at Carmel Place with the bed hidden. Photo courtesy of Ollie. 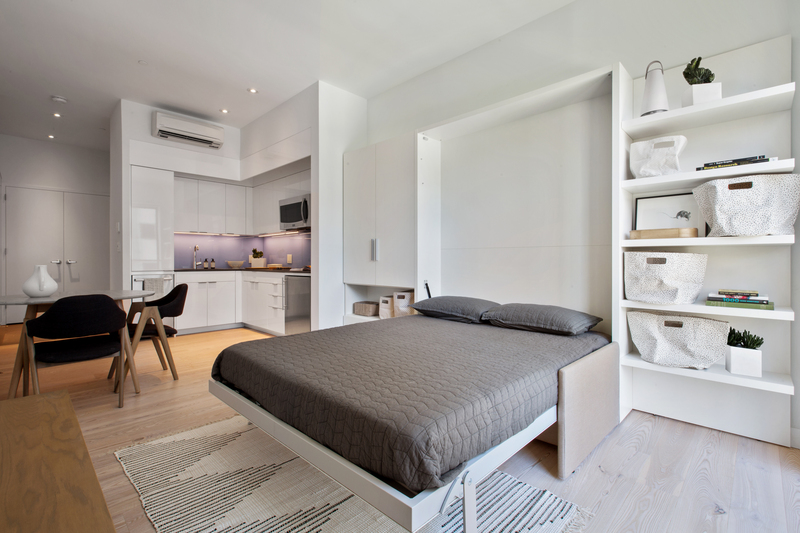 That’s why he checked out co-living set-ups — when you have a private bedroom but shared kitchen, bathroom and lounges — like Common Living in Crown Heights and WeLive in Lower Manhattan, as well as Carmel Place, the high-design micro-unit building in Kips Bay that is part of the brand Ollie. He moved into Carmel Place on East 27th Street last month because he thought it had more privacy than the other developments, but he’s still getting a healthy dose of social activities and other add-ons. Renters in an Ollie-branded building, for instance, not only are greeted with sleek multi-purpose furniture that help a small living room double as a bedroom, for instance, they also get high-speed Wi-Fi, cable, housekeeping services and a butler service called Hello Alfred, which has home managers who pay weekly visits to water plants, make beds and wash dishes. "I'll probably use the laundry service when I'm very busy and don't have time to do it, but I'm the kind of person who's used to doing things for myself,” Kim said. A micro-unit at Carmel Place with the bed out. Photo courtesy of Ollie. On the social side, Ollie renters get the benefits of Magnises, a members-only club providing an entry into a series of curated events and nightlife spots. The building also has a “living community manager,” who’s tasked with programming the fitness club and will focus on things like nutrition as well as organize something called “Ollie Talks,” modeled after TED Talks, said Christopher Bledsoe, co-founder of Ollie, which is a phonetic play on an all-inclusive living experience, he noted. The goal, he explained, is to find smart solutions for the things that cause the greatest “pain points” for renters, like having housekeeping since roommate disputes often are over whose dishes are clogging the sink or whose food is rotting in the fridge. “Everything is about saving time, money or helping [renters] have more fun,” Bledsoe said. The company is in the midst of building a project in Long Island City that will have micro-suites or micro-units for about 425 people, making it the city’s largest co-living project to date, according to Bledsoe. While the market-rate micro-units at Carmel Place start at $2,400 a month before a free month concession — which Bledsoe noted is on the higher end of the spectrum since it’s in pricey Manhattan — the Long Island City project is expected to have rents starting at about $1,500 a month for a private bedroom. 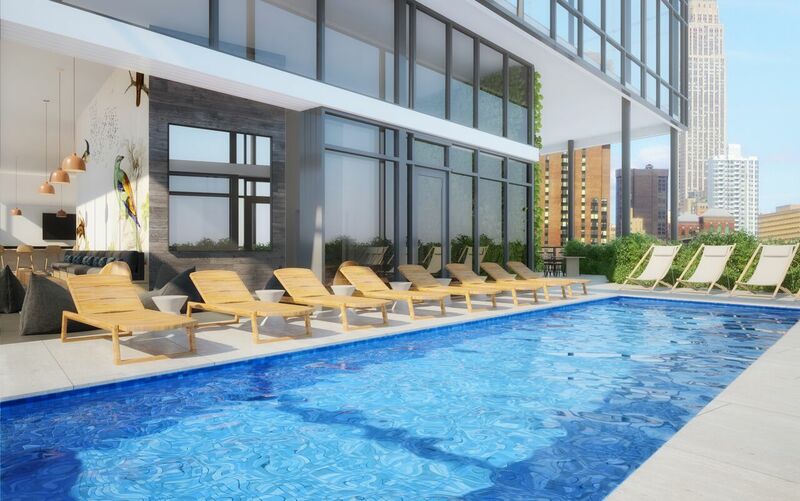 The Long Island City project will also have 20,000 square-feet of space for amenities like a roof deck, pool and fitness center that residents in Los Angeles Ollies will be able to use when visiting New York. A rendering of Ollie amenities. Photo courtesy of Ollie. Sharon Zukin, sociology professor at Brooklyn College and the CUNY Graduate Center, and the author of books on cities and consumer culture, wondered if young people “who are used to being served” — from middle class families — are the ones embracing these offerings. At Carmel Place, where 22 of the 55 micro-units were reserved for affordable housing, Ollie offered those residents to opt in and pay a fee for the additional services at less than cost. About one-third signed up, Bledsoe noted. Amir Ahmdy, 32, who moved there last month after winning a housing lottery, chose not to do so. "Maid service and cable for $180 a month? It doesn't seem worth it,” he said. "We have laundry, a nice roof, and really there's plenty of space."